Hi there! Today, I’m starting a new series on how I’m challenging myself to make my kitchen a greener space. My goal is to take on one project per month. I haven’t planned out anything in advance, so please, leave advice and tips in the comments and I’ll add it to my list. Thanks! I’ve been embracing minimalism lately, and have subsequently purged a lot of my things. We gave away 9 trash bags full of clothes just last month! After a purge, mindfulness needs to prevail in carrying on. I knew I wanted to live a more eco-friendly, natural life. But, I was intimidated with where to start. Instead of doing a major life overhaul, I started with baby steps. I decided I would be the most successful if I started in the area of my life that I spend the most time. That place is Le Kitchen, of course. So, I’ll be challenging myself each month to come up with a new way to make my kitchen more eco-friednly. My day job keeps me in the kitchen developing recipes almost all day. And the rest of my day? Well, that’s spent in the kitchen making the recipes of others. It’s my happy place. My husband and I live in a tiny 1920s house with a tiny kitchen. I don’t know why I didn’t pay more attention to the size of the kitchen when we were house-hunting. I spent the first year in this house cursing it and lamenting the kitchen I left behind in our old house. It had an oversized granite island that was perfect for rolling out dough, oodles of counter space, and so many drawers and cabinets that some were empty! Oh, those were the days. However, this is real life now. Instead of hating the kitchen, I decided to embrace its small size. First, I did a massive purge and got rid of things I didn’t need, or things I only used once or twice a year. Things that went by the wayside were Easter cookie cutters, an extra hand mixer, surplus strainers, an artichoke steamer (I use the regular steamer now), and too many stained kitchen towels. The more my kitchen is filled with only the things I truly use on a daily basis, the happier I am. Currently, I’m at war with the milk frother. My parents bought me a fantastic one, and about half the time, I use it for a chai latte, and the other half of the time I drink plain green tea. So, I’m always moving that dang thing in and out of the cupboard. Anyway, back to the point: counter space is prime real estate in my kitchen. But one thing I’m happy to have out on it ? Pretty cloth napkins. 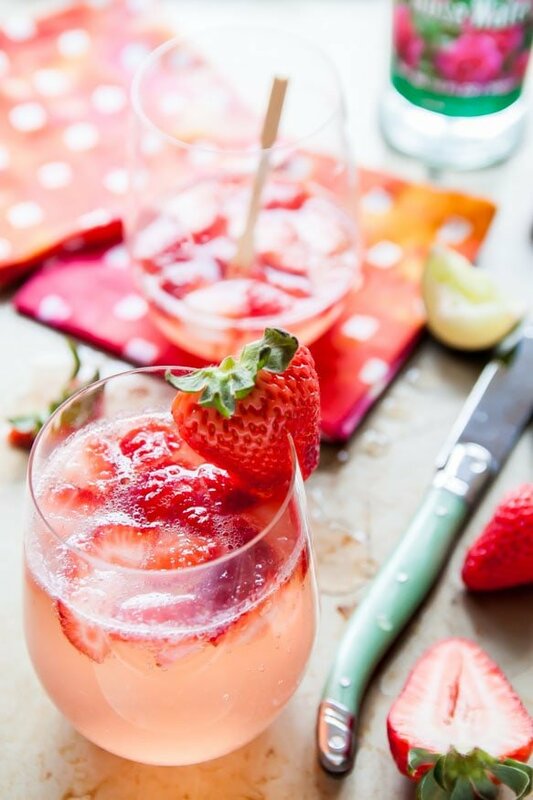 Strawberry Rose Gin Fizz see, aren’t they pretty with drinks? I love these mini cloth cocktail napkins! Ok, so one day I found myself reaching for these tiny cocktail napkins when setting the table for dinner because I just didn’t want to use another paper product. It was probably one of those days where I went through half a roll of paper towels frying something. I had the idea to switch to cloth napkins, but I thought the stains and extra laundry would be too much. But, I gave it a test run. I decided to go with fun, mis-matched bright color cloth napkins so that I didn’t have to worry about stains. And as for the extra laundry, I hardly noticed. The test run went great, and we’ve been using them ever since. When it comes to date night, I pull out matching cloth napkins. Oh so fancy, I know. I’ve found that any stains come right out. Though, if I wipe up a tomato sauce stain with a white napkin, I might take the extra time to rinse it under cold water before tossing it in the hamper. But really, an extra cold rinse before the wash cycle takes care of all of the stains for me. Sometimes, guests say they don’t want to ‘dirty up’ the napkins. It’s silly, but I’ve found that the tablecloth takes much more abuse than the napkins do, every time. If you’re worried, use dark colored napkins. So, tell me: how do you feel about cloth napkins for everyday use? Are you inspired to try them? I purchased a package of Liliane Collection Kitchen Dish Towels (commercial grade-13 to package) from Amazon a several months ago. I use them for EVERYTHING…slopping up messes, drying dishes, grabbing lids off boiling pots, as well as napkins for spaghetti night…the list goes on. I always keep one wet to ‘clean up as I go’ during cooking and often may have half of them dirtied in one day, but they wash up beautifully. Thanks for the brand rec! Love it! Love this series! We’ve been using cloth napkins for years, and it always takes guests a while to realize that they can go ahead and dirty them, but worth it! My challenge: less paper towels. I go through SO MANY! I went paperless in the kitchen about 8 years ago. We love it! I have been known to garage sale specifically for cloth napkins. My ONLY exception is during the prime tomato season – now – when I allow myself to buy one roll of paper towels for cooking bacon for BLTs. I don’t get the newspaper and that seemed a reasonable compromise. I have been using cloth napkins for years. Love them! I just put them in with the towels to wash them. If you have tips on going paper towel free (we use for meat clean up) I would love to hear them! Those tie-dye napkins are soooo cute! And yes… this definitely inspires me to try it out. I’m going to keep my eyes peeled for some cute ones and see if I can get a little collection going. Also, I’m with Erin @ Well Plated. I go through way too many paper towels! Love it, Christina!! I know I could do much better at being eco-friendly myself, especially in the kitchen. We’re doing the cloth diaper thing with the little oen, and similarly, it’s been surprisingly simple. Anyway, I can’t wait to see more from this series. Thanks for the inspiration! I have been using up my fabric stash to make cloth napkins, and we are slowly transitioning to at least a semi-paperless kitchen. Like you said, baby steps! I also keep a large supply of inexpensive washcloths on hand for wiping up spills, but lately they’ve seen a lot of painting and caulking abuse as we get our New Old House ready to move into. I love that you’ve started this series, Christina. And now that I’ve seen those super cute cocktail napkins, I’m picturing some hand-dyed fabric in one of my packed boxes that will be perfect for those, if I ever get moved and unpacked! I always use cloth napkins when we have company but seldom use them for everyday. I don’t like to use paper because of the landfill issues so why not use cloth? Duh! Boy do I feel stupid! Thanks for this reminder….. Welcome to my world. I’ve been using cloth napkins for ever. Well, almost forever. I found that paper napkins disintegrated with moisture. So, they stopped being of my life. My biggest problem is that the cheap cloth napkins aren’t always cut properly, so they don’t refold properly. Cloth napkins are always the best. Napkins, hankies, all that sort of thing. If it can be tossed into a load of laundry, I’m all for it. Even old, stained dish towels are re-used here. Keep it up, lady! I have downsized everything in my life EXCEPT my kitchen. A few things were given away but the majority isn’t going anywhere. And my table linens are amongst my favorite things I own. We each have “our place” at the dining table and we find that we keep our napkins for a few days. I wouldn’t throw my gorgeous napkin on my plate at the end of a meal or use them if we were eating wings though. it’s not only more green but more beautiful! 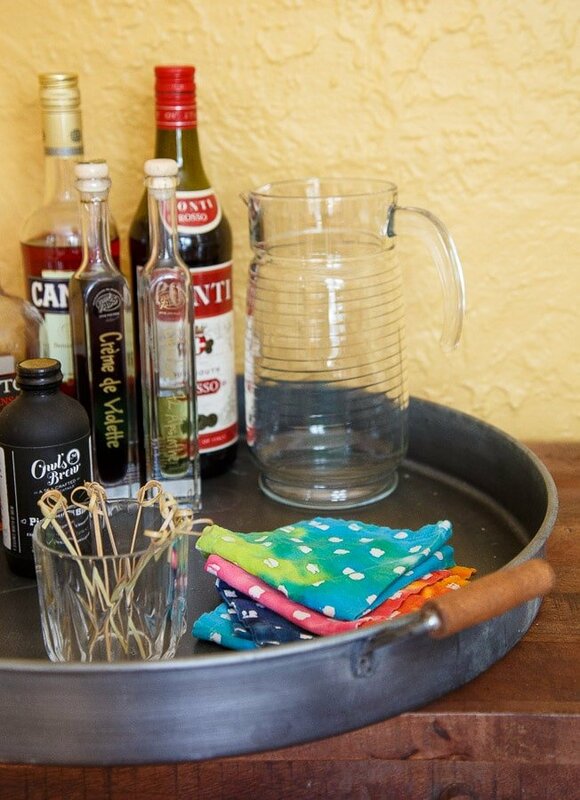 We have been using our cloth napkins for years and years… since my teenage boys were babies! We simply set out new ones for each of us each morning at our usual seats at the table, and after dinner they get tossed into the laundry pile. It is routine for us, and adds a nice splash of color to our table each day. I pick up new ones at tag sales, discount stores, wherever… but really, they last so long and we only use one per day each, that we don’t need to keep too many on hand. When guests are over, we just mix and match! Have fun with it! I had the fortune/misfortune of working at a really cute gift store for five years, so I was always scoring cute, bright napkins on the cheap. We’ve been using cloth for at least 6 years now, and I seriously cannot remember buying paper napkins as an adult (30 now). I love using cloth, and you’re right–it’s not extra laundry by very much. Another way I like to be “green” in my kitchen is by shopping for all my beans, rice, pasta, flour, oats, dried fruit, baking chocolate, nuts, and sugar in the bulk section at my grocery store, and I’ve gotten into the habit of bringing in my own jars for everything. Any grocery store with a bulk department will weigh your jar empty (or even with a little product left in it if you haven’t completely emptied it!) before you fill with your desired product. Oh, and shopping in bulk for spices is a MUST. They even have bulk vanilla, oil, and honey! OH! But back to the napkins: I’m OBSESSED with getting old embroidered linens at Goodwill, Salvation Army, and St. Vincent’s. GAH. The craftsmanship! The beauty! The practicality! Great idea to go “real” vintage! I love the idea of cloth napkins and have a few but, I should probably just start collecting several. I’ll probably always keep a roll of paper towels around for things like frying, but I’d like to replace paper on the actual table. i love this idea! they’re green and they look so much prettier than paper napkins or paper towels. my problem is that i don’t have a dryer – we hang everything to dry. this makes us more green in one way but also makes things like cloth napkins (and cloth diapers, incidentally) so much harder! Hey girl- Great tips!! I like cloth napkins to but we don’t use them, we need to though! We have used cloth napkins for a long time. This is something you might not want to hear as busy as you are with the baby and your work, but they are surprisingly easy to make. That is how we started using them, as I wanted to sew something but had very little leisure time to sew. So just buy them and enjoy now. 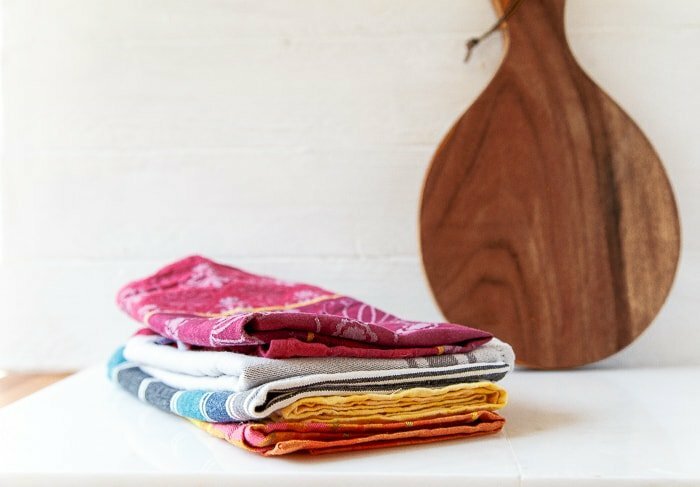 While I bought a few packages of colorful bar towels to use in the kitchen, I haven’t really been able to add to my cloth napkin stash as much as I would like. But my favorites? Some white embroidered ones I snatched up at a thrift store. They’re so pretty, I usually don’t get them out very often. I would love to build up my collection more. Thanks for the reminder. My mother in law made a set of 8 for me using a decent quality quilting fabric with a pattern. If any of them are stained I wouldn’t know! Christina!! I love you even more! My hippie heart loves this post! I have and only use cloth napkins too. I use only cloth for all my house cleanings too, they’re the way to go. Excited to see what is next! After my kids were born, we began reducing the chemicals that we use to clean and began using more cloth. We bought a twenty pack of white washcloths at Ikea and I hardly ever use paper towels as anymore. We mainly use soap and water for counters, appliances, and windows. All my kid wiping and kitchen cleaning is all cloth now and I hardly ever use paper towels. It’s wonderful! All of this rings a bell. We recently moved and I got rid of a lot of stuff. Ok, so sooooome stuff might still be in my in-laws basement, but, like you said, baby steps. I don’t have tons of kitchen gadgets, but I did unload almost all silverware/flatware that didn’t have heirloom status to me. If it didn’t belong to my Nana, out it went. I can actually find things in my cupboards now. I also love my kitchen towels. They make life so much easier! I keep a separate stack for making juice too. 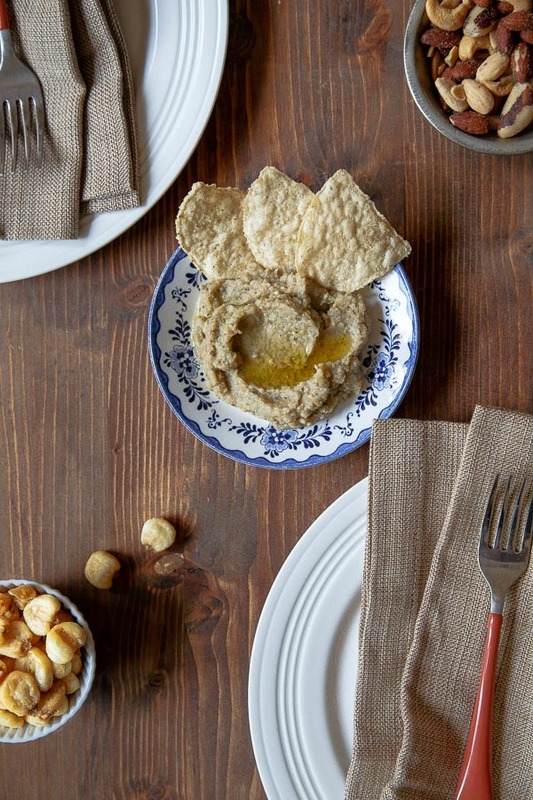 Pingback: Date Night…for 3? | What The Flicka?